The blast tore through the building as the victims were sleeping in the predawn darkness on the insurgency-plagued island of Mindanao, which is home to the Philippines’ Muslim minority. Blood-streaked prayer mats and shattered glass could be seen on the floor inside the mosque where heavily armed security forces were standing guard, footage from the scene showed. The blast came as the Catholic-majority nation was on high alert after a cathedral bombing claimed 21 lives at Sunday mass in an assault claimed by the Islamic State. 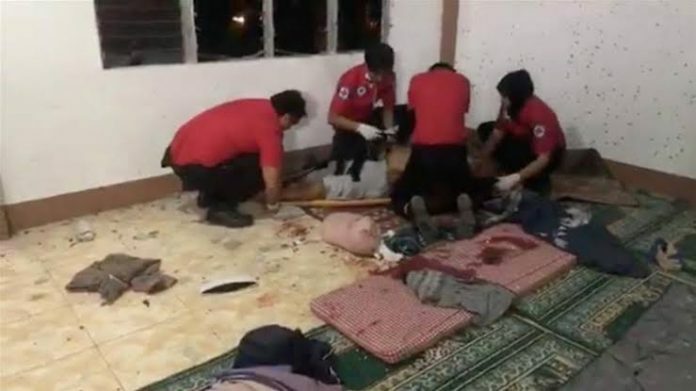 Two people were killed and four others wounded in the mosque attack in Zamboanga City, authorities said, adding they had no indication so far it was retaliation for the cathedral bombing. Authorities have not publicly identified any suspects and no one has claimed responsibility for the mosque attack. Security forces are also hunting for the bombers behind the cathedral assault on the overwhelmingly Muslim island of Jolo, which security forces initially said was not a suicide bombing. However, on Tuesday President Rodrigo Duterte contradicted them saying one of the bombers had blown himself up outside the cathedral. The probe was zeroing in a group tied to the notorious Islamist kidnap-for-ransom group Abu Sayyaf, which has pledged allegiance to the Islamic State. Police said they tried to arrest one of the suspects on Tuesday, but he got away and an armed man was shot dead by officers in the process. The attacks have cast a shadow over hopes that voters’ decisive push to give Muslims in the south more control over their own affairs would help quell long-running separatist violence. Rebels and the government in Manila have expressed hope the new so-called Bangsamoro area will finally draw the investment needed to pull the region out of the brutal poverty that makes it a hotspot for recruiting radicals. However, hardline factions aligned with IS were not part of the decades-long peace process with the nation’s largest separatist group, the Moro Islamic Liberation Front, that culminated January 21 with the resounding approval of a new Muslim led-region in the south. Jolo, which is home to hardline Islamist factions, is the only area in the southern Philippines that voted against the Bangsamoro. The grenade attack on Wednesday drew immediate condemnation from authorities. “There is no redeeming such blasphemous murder. It is the highest form of cowardice and obscenity to attack people who at prayer,” said regional leader Mujiv Hataman.